Madeline is a good rhyming book accompanied by a funny storyline. The pictures in Madeline are absolutely breathtaking and the story is one that children could read easily and even learn a few things. let kids finish the lines on each page. i.e. "In an old house in paris all covered with . . ." kids yell "vines!" The kids like the rhythm and I do like the social commentary. Madeline is an adorable story about a little orphan girl who is not afraid of anything. One night she woke up crying and had to have her appendix taken out so she went the hospital. When all the other little orphan girls came to visit they had brought Madeline flowers and looked at her scar on her stomach. When the little girls got home they all wanted their appendix out too. Madeline is an adorable classic story that I remember reading all the time when i was a little girl. I also can remember watching a television show with her in it. I have always enjoyed Madeline stories. This story is about twelve little girls that live in a boarding house in Paris, France. The youngest girl is Madeline. She is adventurous and not afraid of many things, but she worries Miss Clavel. Madeline gets her appendix taken out and the girls go to visit her. The story has a lot of picture of the scenery in France. I used to read this book as a child and watch the television show. This book was one of my favorites because Madeline was never afraid. With its iconic images and vocabulary of simple rhyming words, this classic picture book has delighted children for seventy years. Madeline makes for an excellent read aloud book, and is simple enough that children can also read it for themselves. This story is about 12 girls, one named Madeline. Great for grades k-5. The children could paint a picture of Madeline. This was one of my favorite books as a child because it was my name "Madeline." However, this book would be good to read to children because it teaches children that when you may be in a scary situation, you need to be brave. It also has good ryhming words. When I was a child, I remember reading Madeline with my mother. 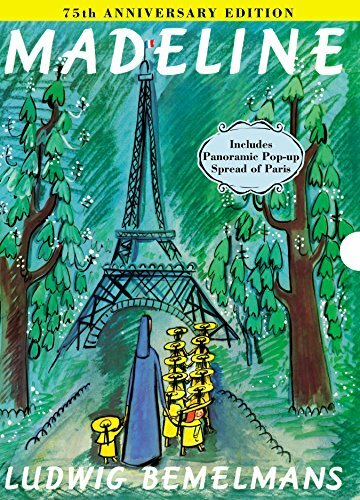 I even remember the TV series that depicted Madeline's adventures in Paris. This speaks to how memorable Ludwig Bemelmans' character really is. The simple watercolors of yellow, black, and gray are paired with full color complicated scenes of city life in Paris. The Notre Dame looks very realistic, though bathed in a dreamy aura of rain. Miss Clavel's worry gets translated into a blur on the page. The Caldecott Honor-caliber illustrations are a pleasure to look at, and they also reflect the wonderful story of Madeline's appendix. Madeline is a little girl who lives in an old house in Paris with twelve other little girls and Miss Clavel. The girls do everything together and when Madeline has to get her appendix taken out, the other girls want their appendix out too. This book also introduces small story lines for other Madeline books. There are Madeline videos that kids could watch after reading the book. Mr. Bemelmans died in 1962 after completing his sixth story about Madeline, Madeline's Christmas. Madeline is a young girl living in an orphanage in France. She is the bravest of all the 12 girls living there and one night Miss Clavel says "something is not right" and Madeline is crying in pain and it rushed to the hospital where she has her appendix removed. I have always loved this book, the pictures and the flow of the rhyming words. When I was younger I was Madeline for Halloween and in 2008 I had to have my appendix removed as well so I kept saying I was just like Madeline ha ha.